pages, or selected regions; what printer to print on; and the number of copies to print. This section describes these various printing options in detail. The “Properties” button in the Print dialog box gives you access to printing options for the paper, graphics, and fonts used by your printer. This allows you to change these options just before you print. If you don’t want to print the worksheet immediately, you can change some of these options in the Page Setup dialog box as described in “Layout” on page 76. 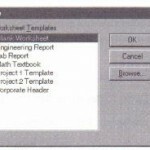 • All: Click this button to print all pages in the worksheet. • Pages: Click this button to print a range of pages. Then fill in the two text boxes to indicate your selection. If you’ve selected a plotter as your output device, you’ll only be able to print one page; the text box beside “To:” will be grayed out. Bysefault, Mathcad sends its output to whatever printer you installed as a default printer under your operating system. 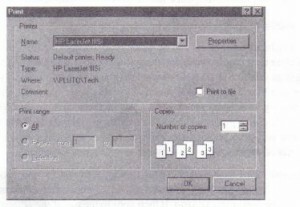 The installed printer is shown in the “Name” drop down list. 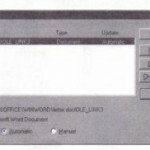 You may send your output to any printer you have installed under your operating system; simply choose another printer from the “Name” drop-down list. To redirect your output to a file, click the “Print to File” checkbox. 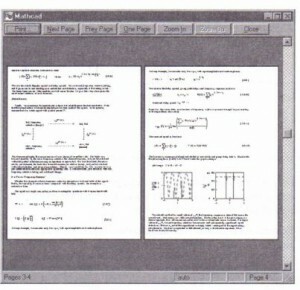 Because Mathcad worksheets can be wider than a sheet of paper, the idea of a “page” is not as clear as it would be in, for example, a word processor. You can scroll as far to the right as you like in a Mathcad worksheet and place equations, text, and graphics wherever you like. 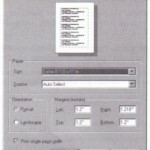 As you scroll horizontally, however, you will see dashed,vertical lines appearing to indicate the right margins of successive “pages” corresponding to the settings for your printer. 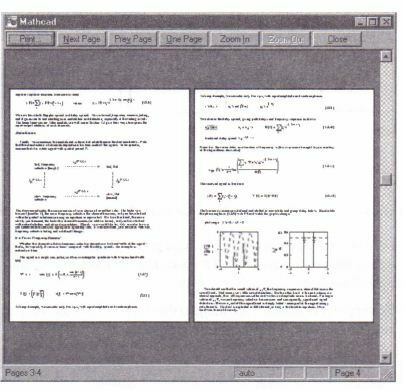 The sections of the worksheet separated by the dashed vertical line will print on separate sheets of paper, yet the page number at the bottom of the Mathcad window does not change as you scroll to the right. 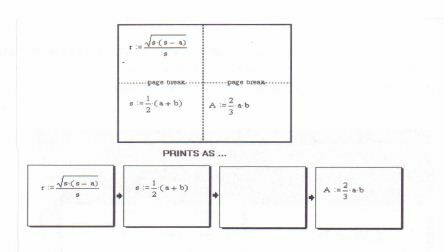 You can think of the worksheet as being divided into vertical strips as shown in Figure 4-1. Mathcad begins printing at the top of the left-most strip and continues until it reaches the last region in this strip. It then goes to the top of the adjacent strip and prints every page down to the last region in that strip. This procedure is repeated until everything in the worksheet has been printed. Note that certain layouts will produce one or more blank pages. • single page width” box to put a check in it. • Choose Print from the File menu. • Type “2” in the boxes next to the words “From” and “To.” This suppresses printing of the upper-left and upper-right quadrants. • Choose Page Setup from the File menu and make sure there is a check in the “Print single page width” box. This suppresses printing of the lower-right quadrant. Note that this makes it impossible to print the upper- or lower-right quadrants by themselves. 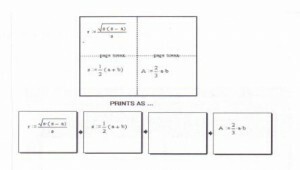 Figure 4-2: Previewing the printed output.